Fuel, Transport and an experienced driver are all inclusive. Probably the most powerful excavator able to fit through leass than a metre gap. Canopied or cabbed versions available with a variety of ‘Quick Hitch’ buckets. Suitable for the larger project where space is tight but not minimal. 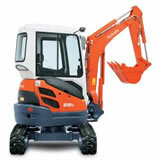 Supplied with a choice of ‘Quick Hitch’ buckets. The best of both worlds! 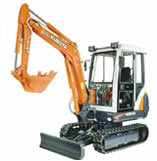 A ZERO SWING narrow access machine with the capabilities of a three tonne excavator complete with ‘Quick Hitch’ buckets. Cancellations will incur a £50 fee to cover costs.